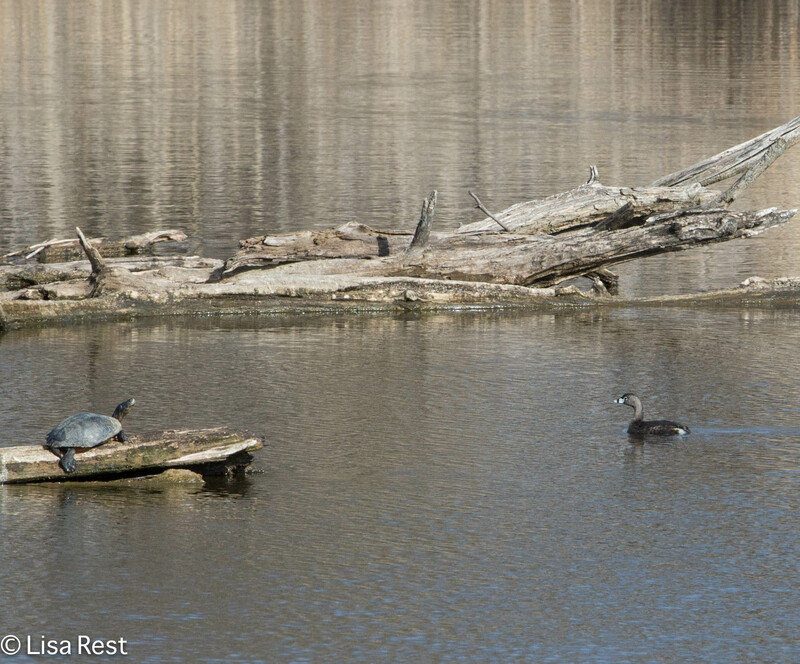 So I went for a walk at the Portage yesterday even though it was cloudy, because spring migration is upon us, and I wanted to get out with the camera, especially after I forgot to take it with me on Saturday when I joined Illinois Ornithological Society’s trip to lakes in Lake County looking for Common Loons and other waterfowl, named “Loonapalooza” by my friend and the organizer and leader of the trip, David Johnson. 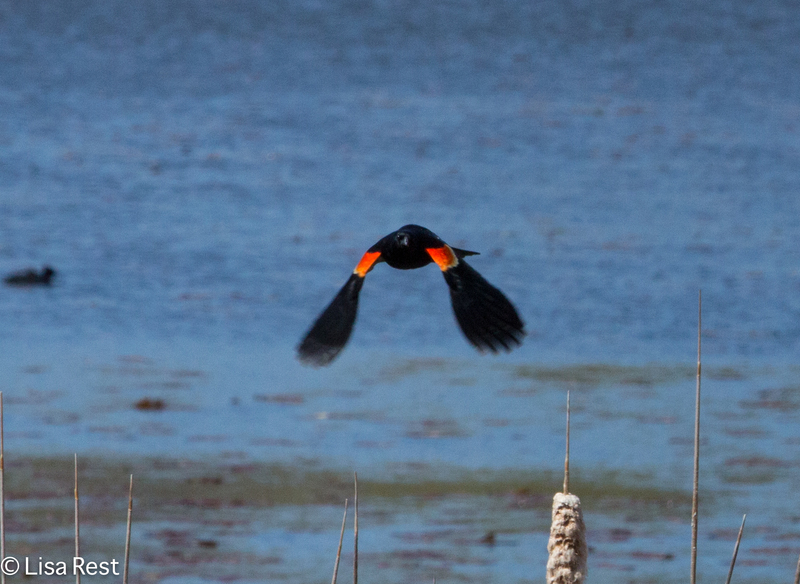 I drove for an hour to get to the meeting place only to discover that I had remembered everything (scope, tripod, water bottle, binoculars, backpack, and I thought my brain) but left my best camera with its new lens at home. It never made it out the door. Next time I’m leaving that early in the morning I suppose I should write a list and put “brain” first, camera second… I’m blaming it on my medication, but there’s no need to go there now. Above all this useless information is a young deer that appeared across the water, came across the bridge and walked almost toward me, very unusual for after-nine-ish in the morning. Below, a Red-Tailed Hawk flying over. 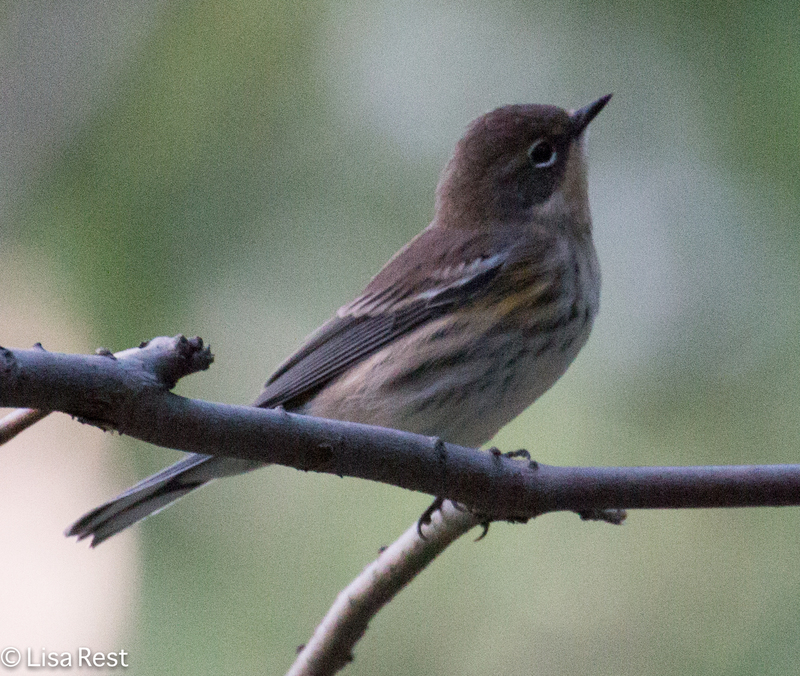 The good news is I am in love with the new lens, which until recently I didn’t even know existed because there are times when I quit looking for any more camera stuff, but the two guys with cameras on the Panama trip informed me that Canon had finally come out with a new, improved 100-400mm lens. I had stopped using the old one, which I still have, but had hardly any use for. Instead I have been struggling with the monster Tamron lens for the last two years, which was getting harder and harder to carry around and focus. I think that lens might be going on the recycle list too. 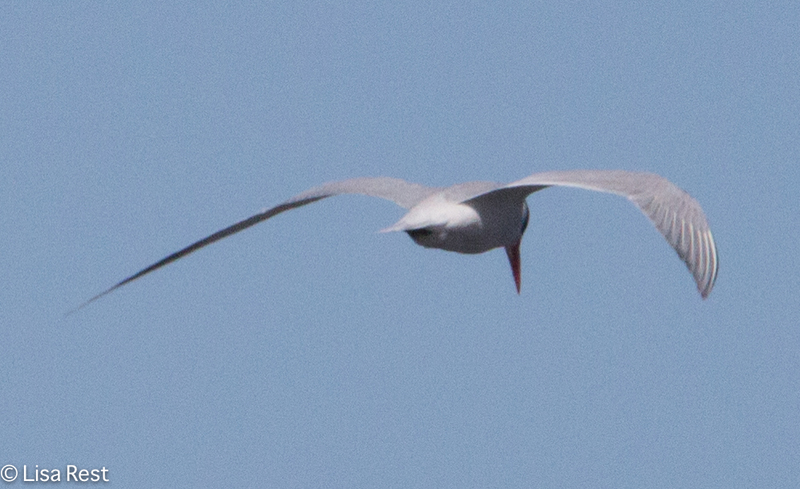 Because the new Canon 100-400mm lens and my Mark III 5D are really happy together, and an extra 200mm doesn’t necessarily mean you’ll get a decent picture, especially if you can’t hold the equipment still. 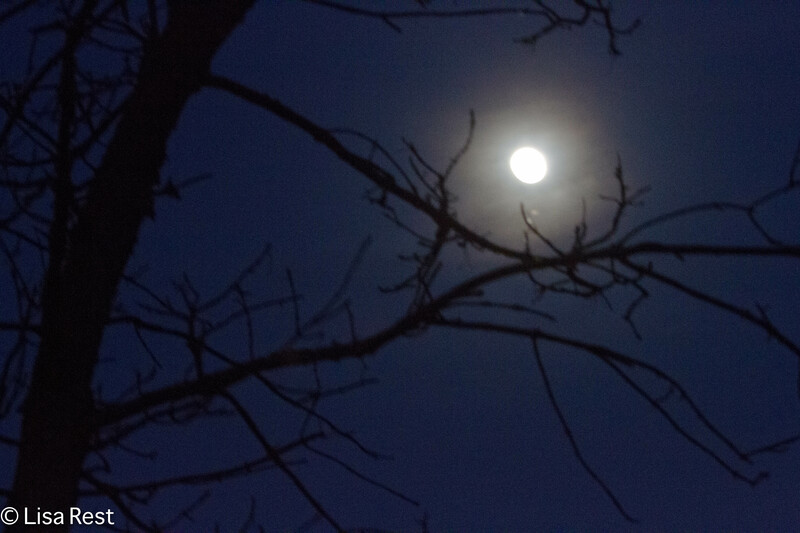 That said, there’s still only so much you can do with anything in poor light. 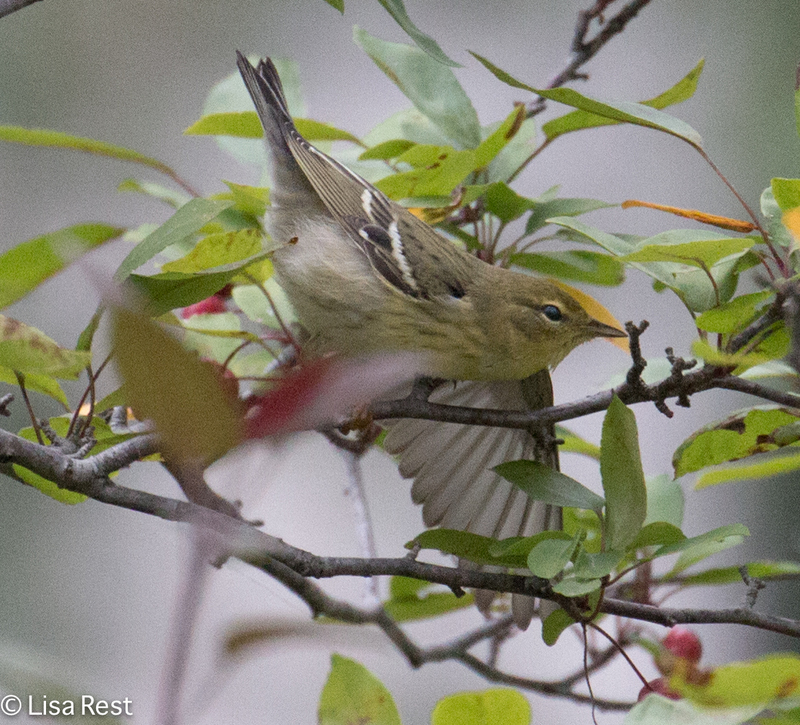 Like the very cooperative and friendly Golden-Crowned Kinglet below, he was pretty dull and drab yesterday. 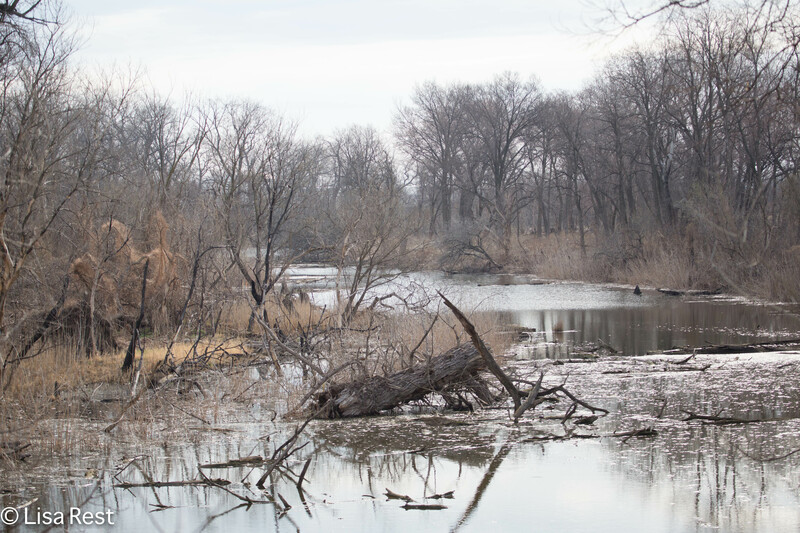 The dead wood in the water was perhaps more suited for the weather. 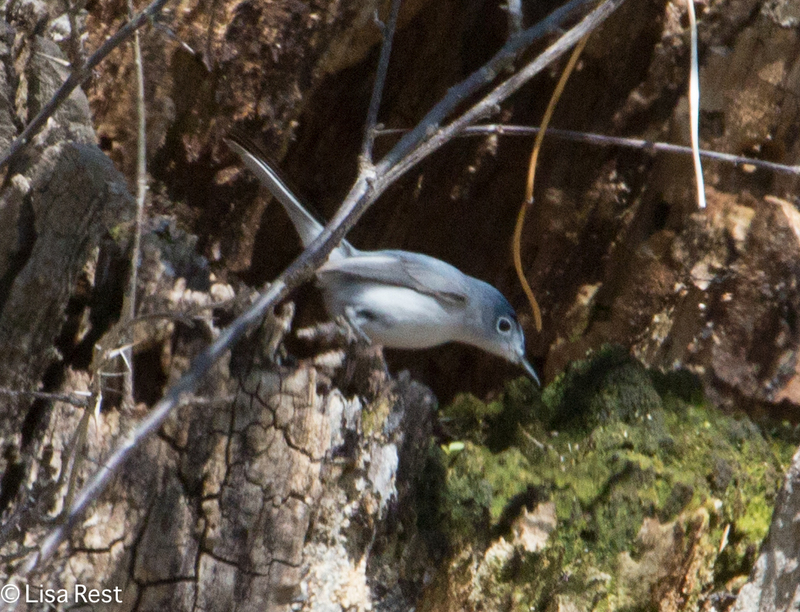 It is transforming into…I’m not sure what bird that resembles on the right, below. 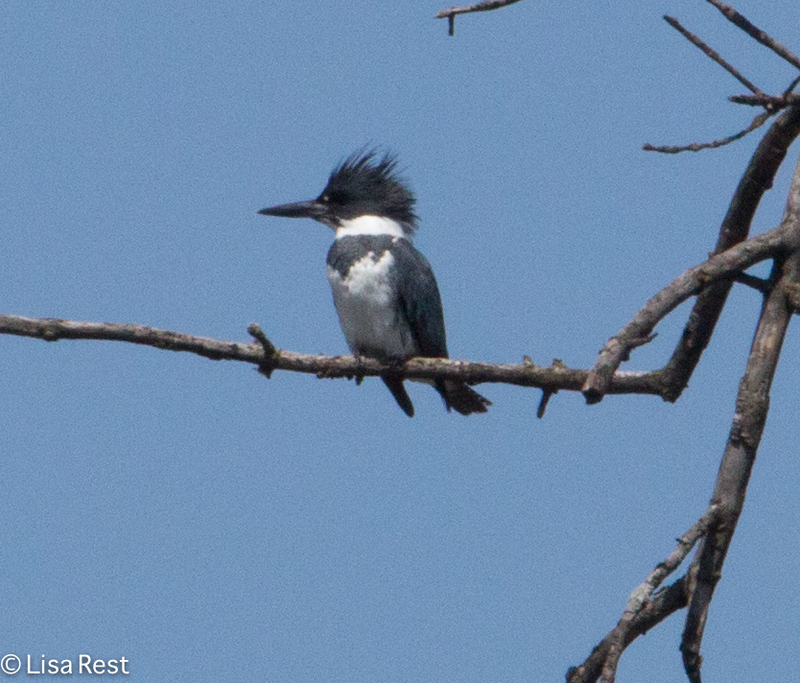 I was happy to see a Belted Kingfisher on the water. Although even he looks gray. 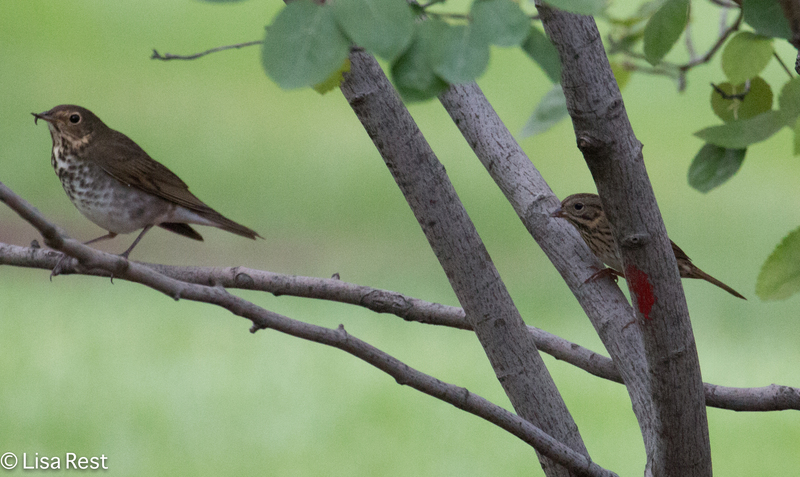 Sparrows were abundant. 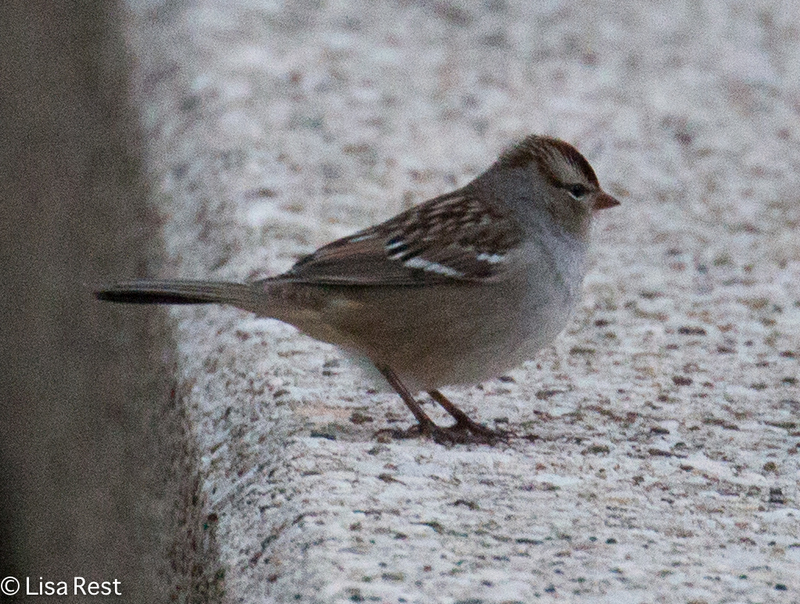 White-Throated Sparrows, which are a dime a dozen on the lakefront, seem special here. There were lots and lots of Song Sparrows singing like crazy, even though I managed to capture a silent one. Below these two, a couple hidden shots of a fairly distant Fox Sparrow, whose rufous caught my eye and brightened up the surrounding gloom. And the final sparrow at the bottom, a Chipping Sparrow, is my first one of the season, although I’m sure I heard one in neighborhood last week. 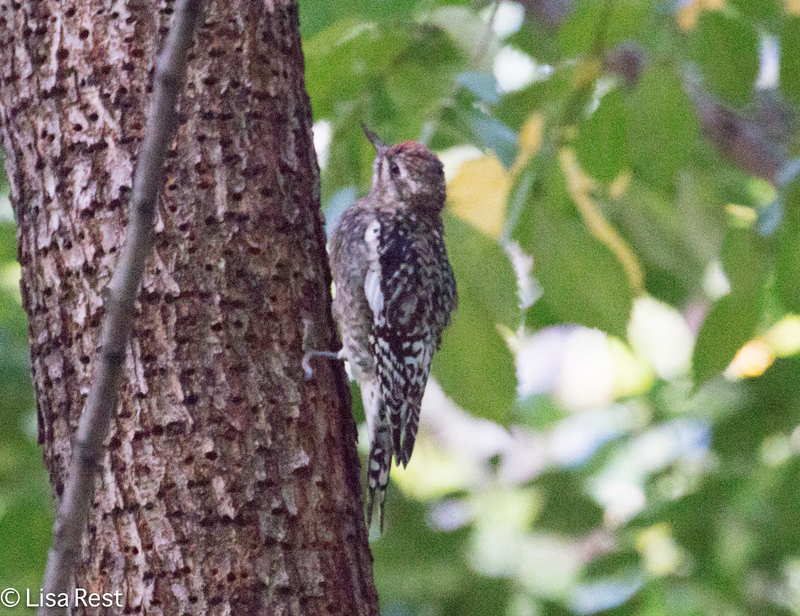 Lots of woodpeckers but they were hard to get on. 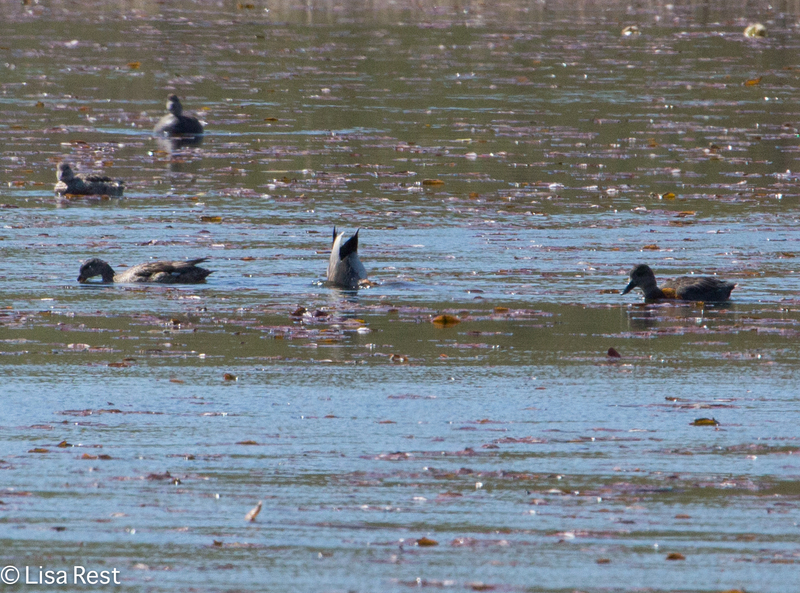 Below is a Red-Bellied on the left. 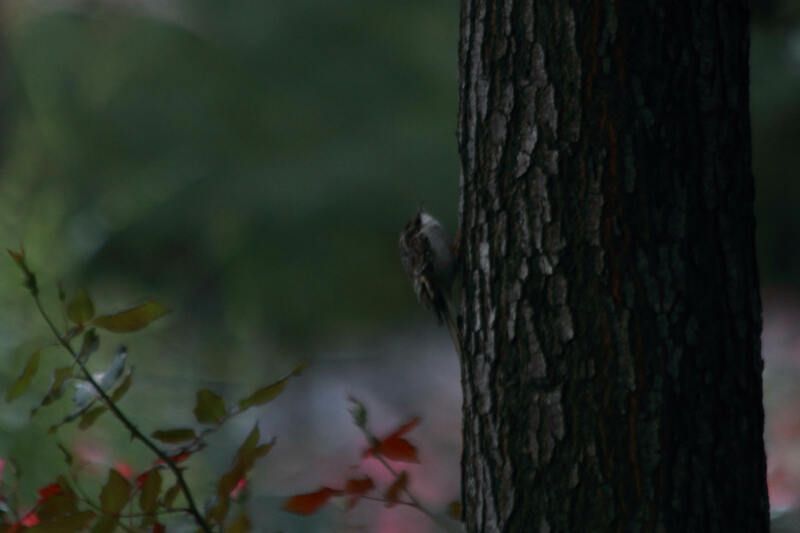 The little bird on the right is a Brown Creeper, not a woodpecker, but spends as much time on trees as woodpeckers if not more, and it’s also the first one for me this spring. 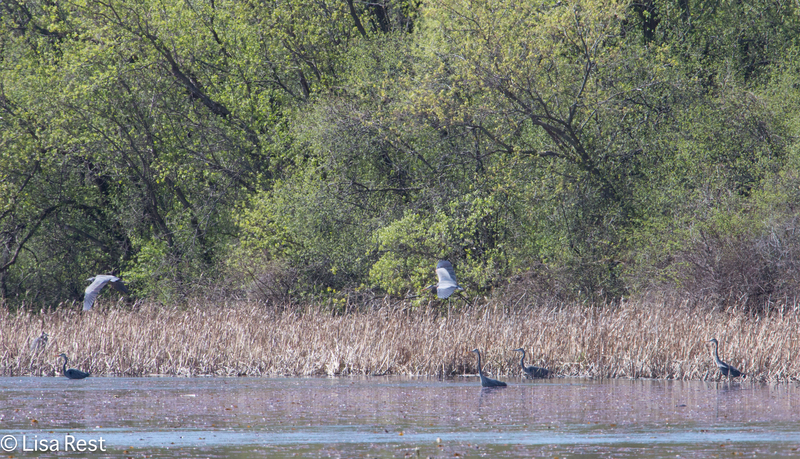 Click on the pictures to enlarge, and look at how beautifully the creeper blends in. There was a bench at one end of the water but it has disappeared. However, there are a few other places to sit. 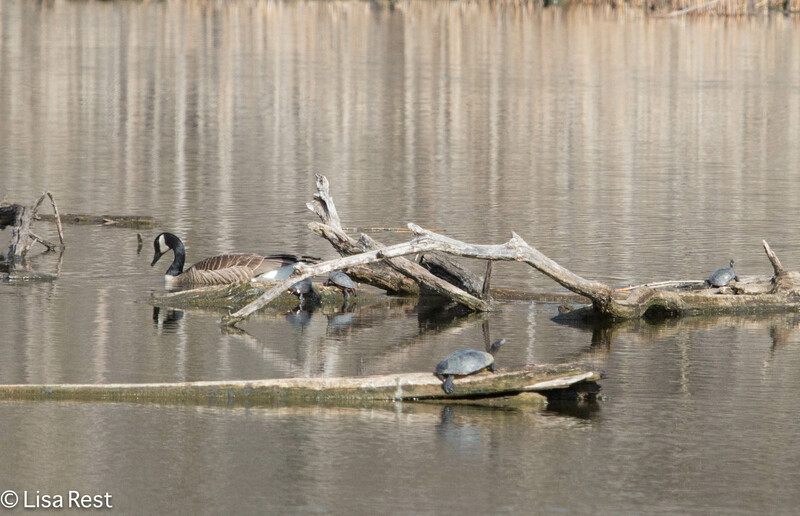 I stopped to rest on a boulder that is near one of the information boards, and watched five Canada Geese flying in together and then starting to squabble over positions. 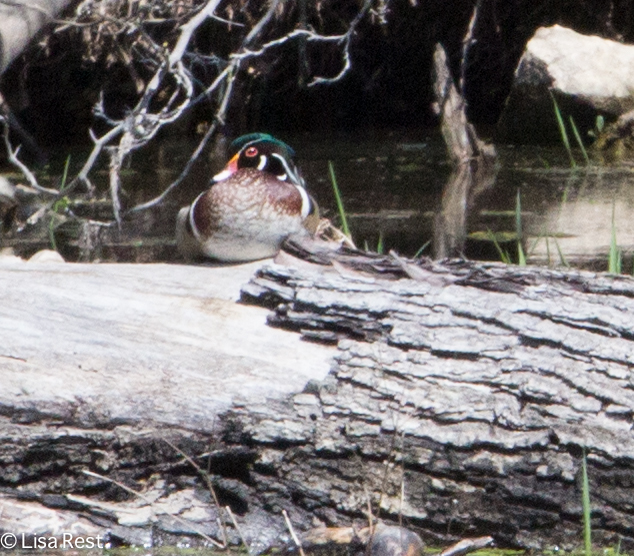 I don’t think I saw Wood Ducks last year, so it was nice to see a pair yesterday. Here’s the guy, his mate was less accommodating. 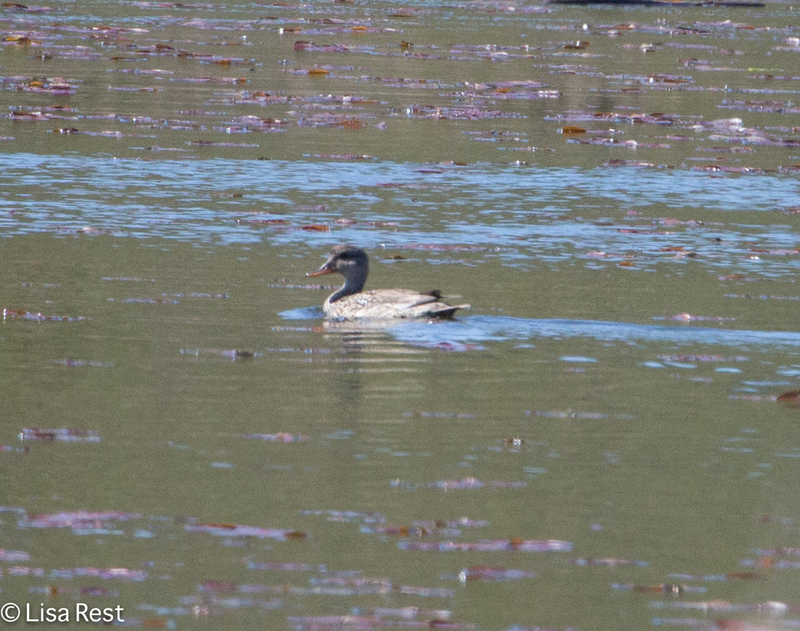 Couldn’t resist one more of the Shoveler. Okay, well, tonight I’m going swimming unless there are thunderstorms, and I promise I will finish The Panama Pictures so I can start sharing them with you. Thanks to everybody for stopping by, for following my inconstant blog. Happy Monday. I keep trying to get through all the pictures from Colombia and identify everybody who’s recognizable, but life keeps getting in the way…further complicated by signs of spring. 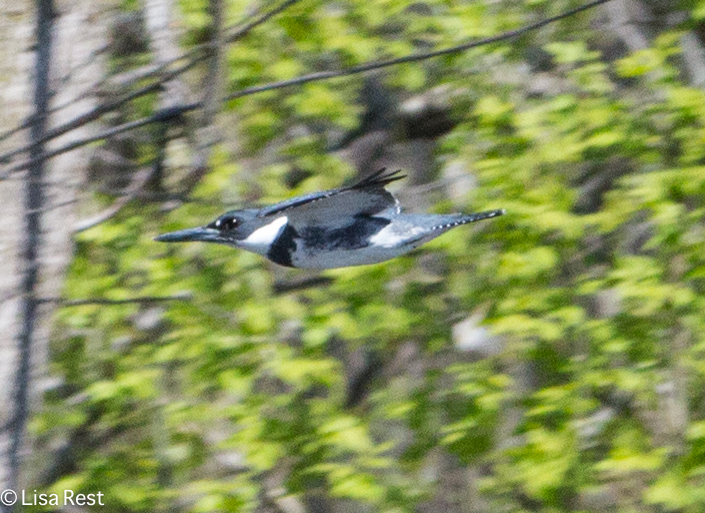 Like the Belted Kingfisher above. He seems to have made the stripped-down Chicago Portage his summer home. I have seen him two weekends in a row. These pictures were all taken last weekend. 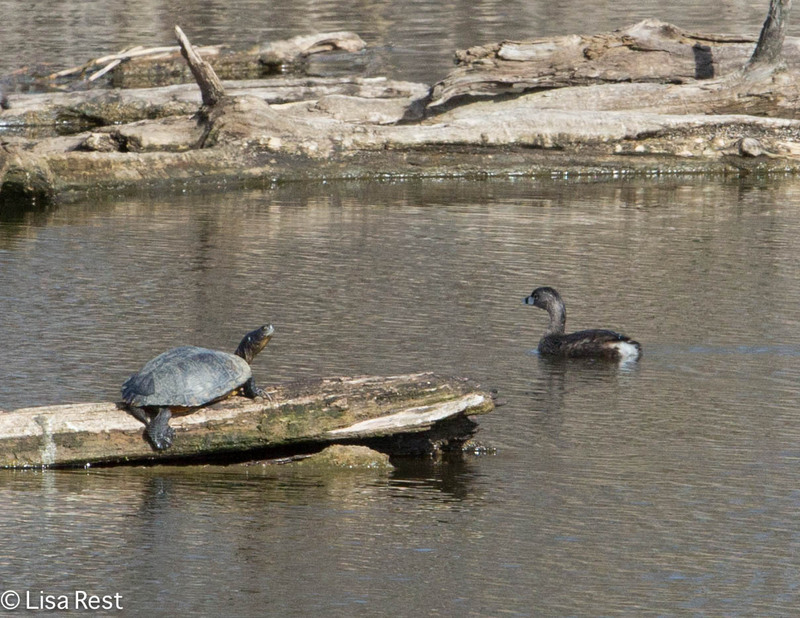 I went to McGinnis Slough and the Chicago Portage on Sunday because the weather was reasonable. We’ve been otherwise chilled by northerly wind blasts all week, even going down to freezing one night, I forget which, I only remember having to dump the ice out of the bird baths because I had already unplugged them. 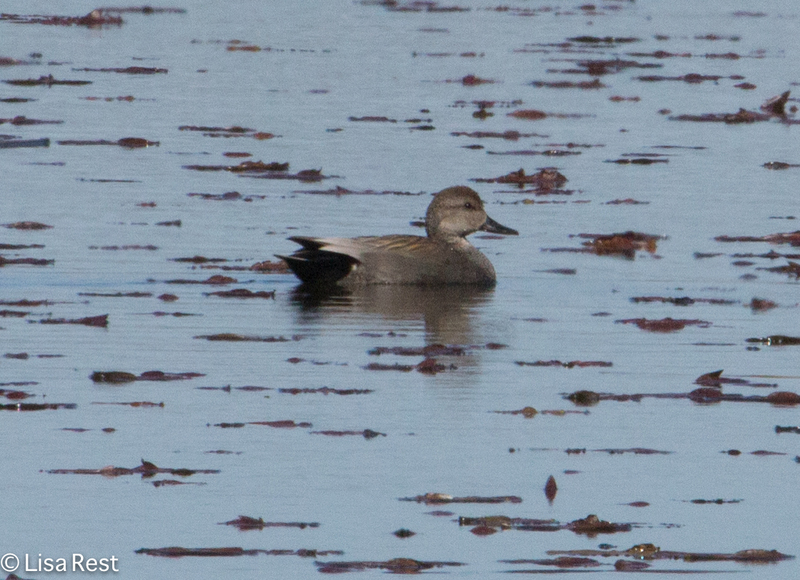 Gadwall – check out the one that’s dabbling – if this is the only part of the bird I see next time I’ll know it’s a Gadwall! 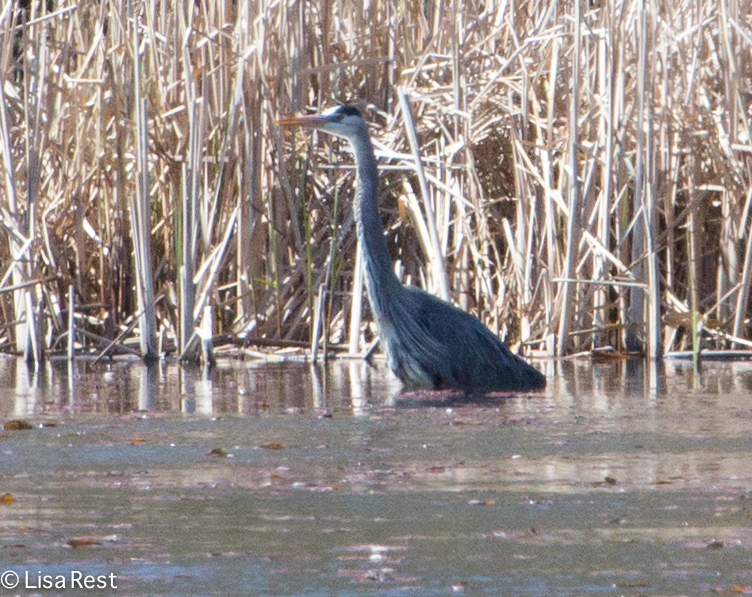 Not a lot to photograph at the Slough, most everyone was too far away in the water, but it was nice to hear Soras calling, and to count eleven Great Blue Herons and a lot of Gadwall. 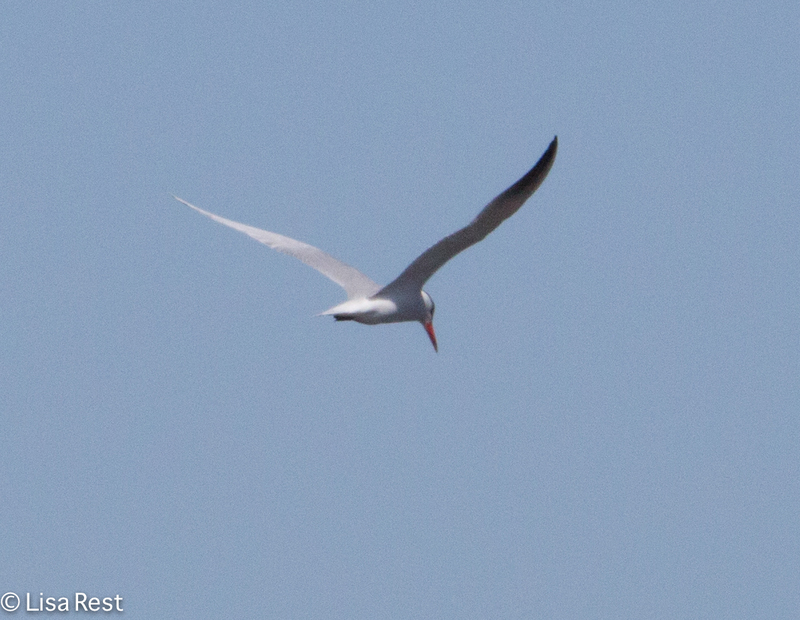 Also nice to see a Caspian Tern. 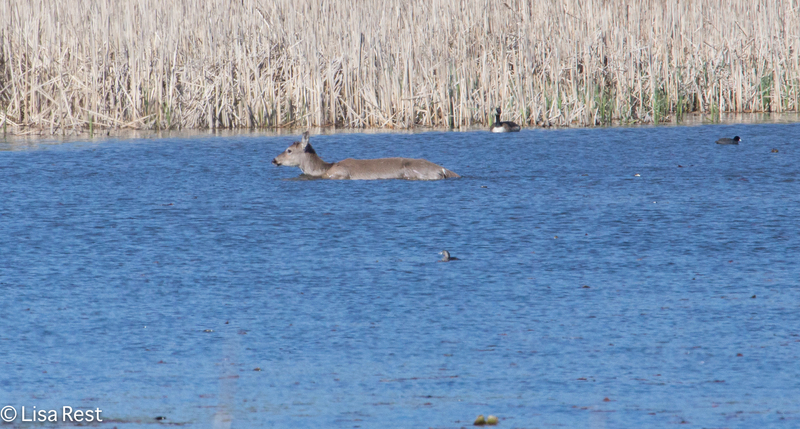 But perhaps the biggest surprise was a deer making its way across the smaller part of the slough, which I guess gives an idea of how not very deep it is. 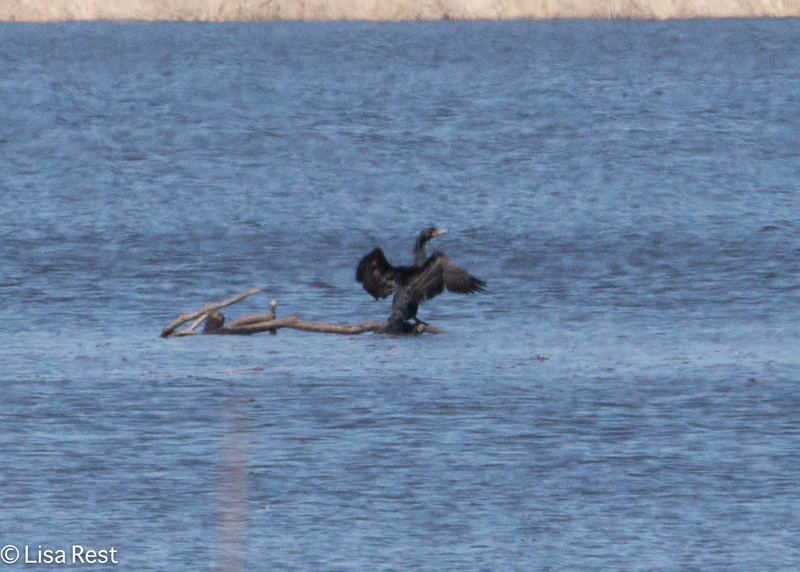 Below the deer is a Double-Crested Cormorant drying out after a dive. 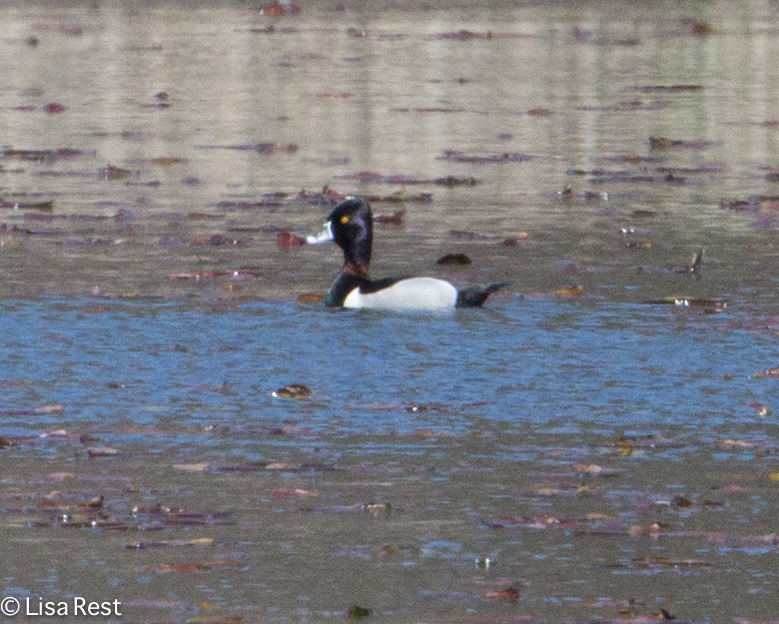 Something else I don’t know if I’ve ever seen well before – the “ring” on a Ring-Necked Duck’s neck. Click on the picture to see what I mean. 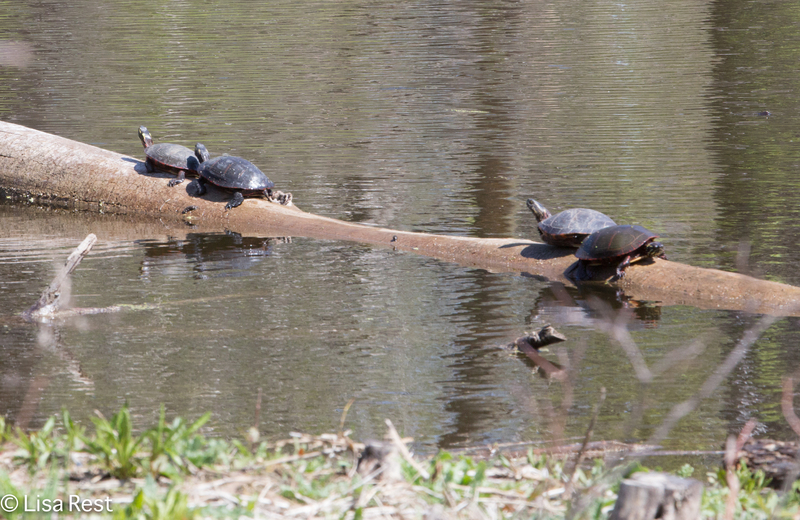 Not a lot different happening at the Portage yet… I could have had a substantial turtle count. 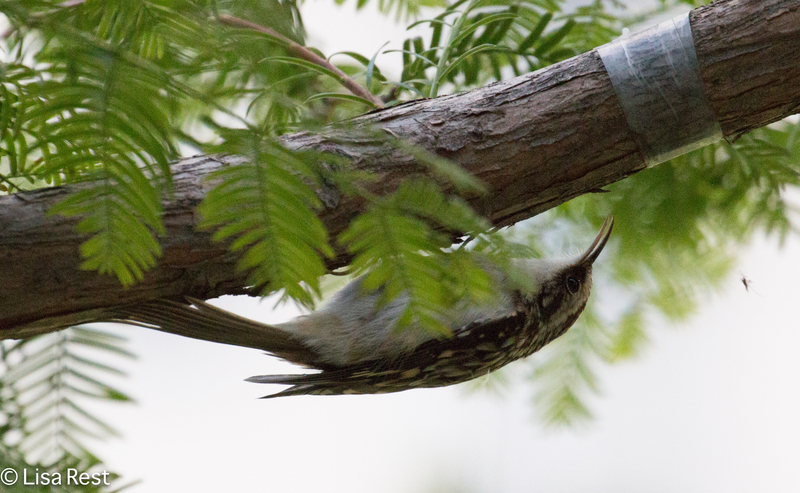 Brown Creepers are always a surprise for some reason. 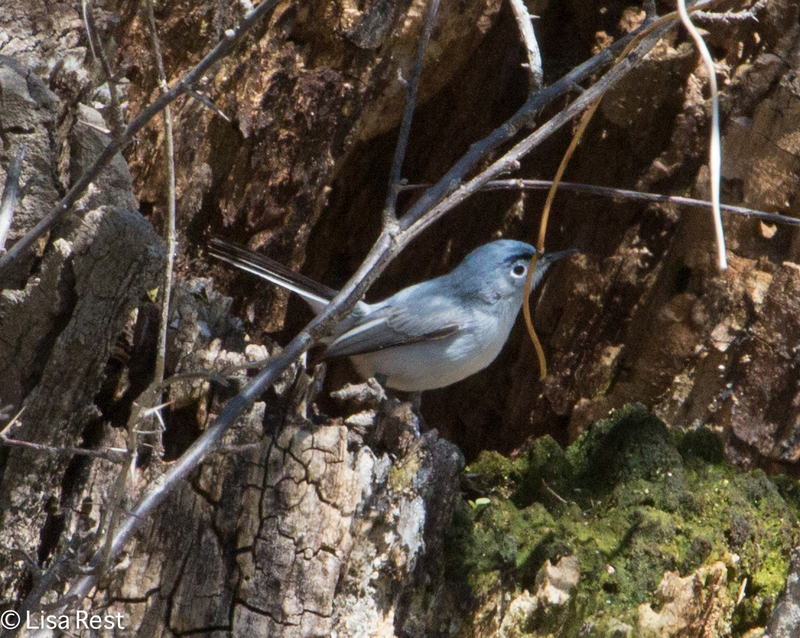 And this Blue-Gray Gnatcatcher was cooperative as long as he felt hidden behind the twigs, which he certainly was. 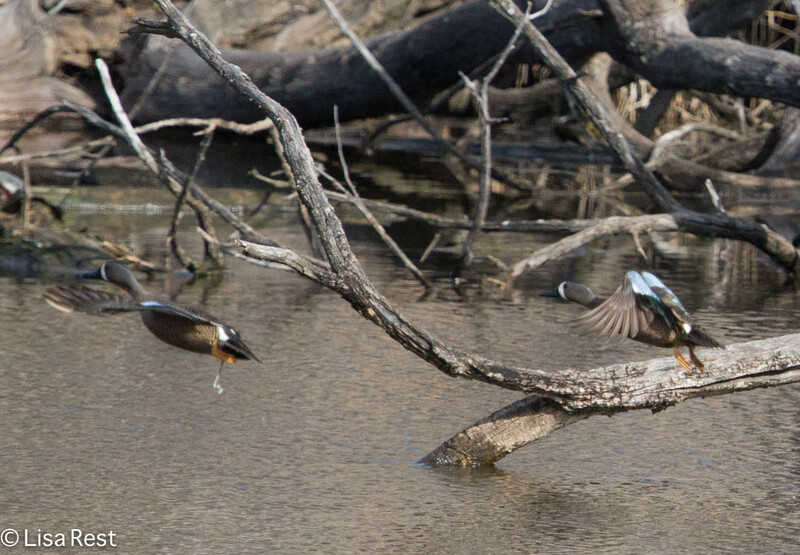 Caught the Kingfisher taking a break. 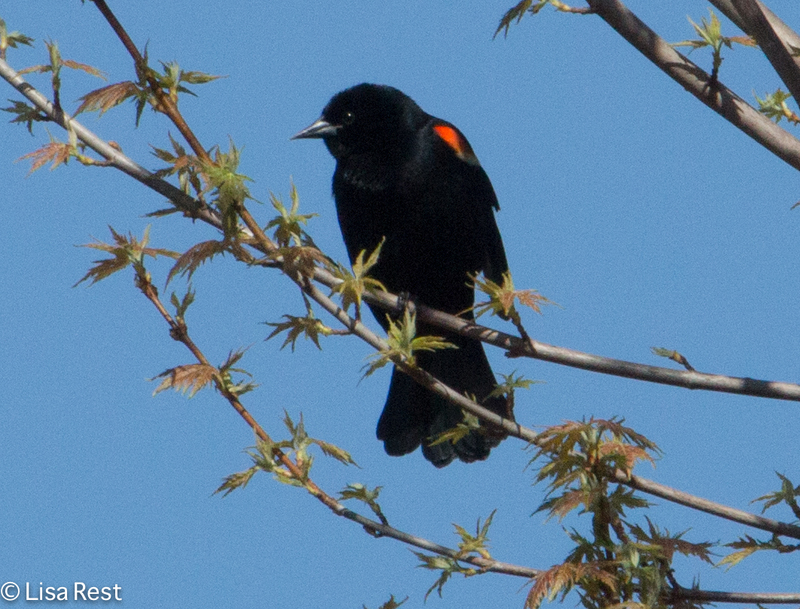 Female Red-Winged Blackbirds are starting to arrive, but I don’t have a picture of one from last weekend, so I’m just including this guy-bird again. I’m not getting any “planned” posts done, so this one is an interim life-goes-on-in-spite-of-me digression. Spring is arriving, and we even had some warm days to go with it. 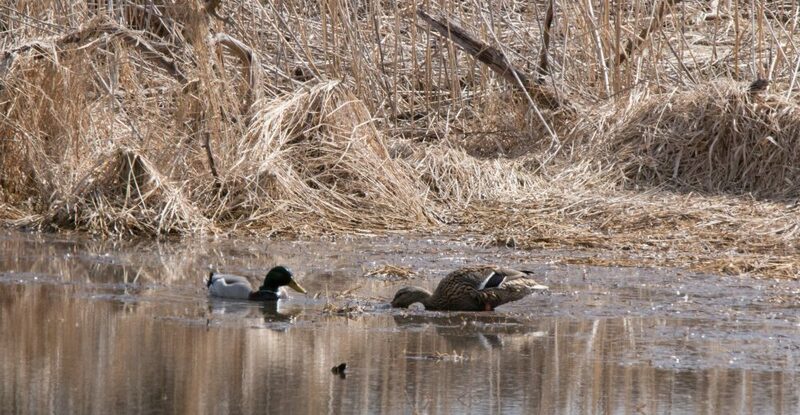 Yesterday morning began still quite warm, but along with predictable April Showers, we are now plunging ever-so-slightly back into temperatures cool enough to flirt with snow. My fits and starts seem as arbitrary as the weather. Tuesday night on the way to the pool, about halfway, the power steering began to groan loudly on the old, rusted out Ford Taurus. After a good swim, we moaned and groaned all the way home. Glad I made it, because the writing was on the wall: you know it’s over when your mechanic doesn’t want to try fixing things any longer. Knowing the end was nigh, I hoped to make the car last a couple more weeks until I got back from Texas, but apparently Little HP (named after its Hewlett-Packard fleet car origination: purchased with 20,000 miles on it, now has only 81,000, but once when getting a fairly minor dent straightened out discovered it had been in an accident from the tell-tale difference in paint color, which explained a lot of its odd quirks) already sensed rejection and, as little as I drive, is now unsafe at any speed. 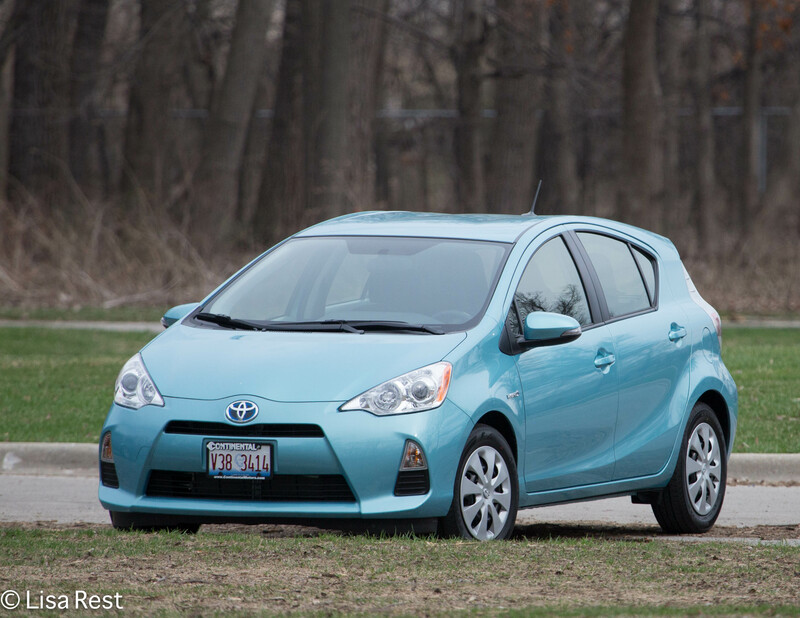 I already knew what I wanted to buy, so after researching the possibilities online, I made an appointment with the nearest Toyota dealer for Saturday, and bought a 2013 Prius c. I’ve been trying to substitute “Priuses” for “Porsches” in that lyric from Janis Joplin’s “Oh Lord Won’t You Buy Me a Mercedes Benz” …”My friends all drive Priuses, I must make amends.” It’s true, three (if not all) of my friends drive Priuses. Maybe this should be the 21st century version of the song. I have already lowered my carbon footprint. I’ve put 57 miles on the car and the needle has not moved from “full.” The purchase will probably force me to lower my footprint even more since I won’t be able to afford any long trips overseas for quite a while. 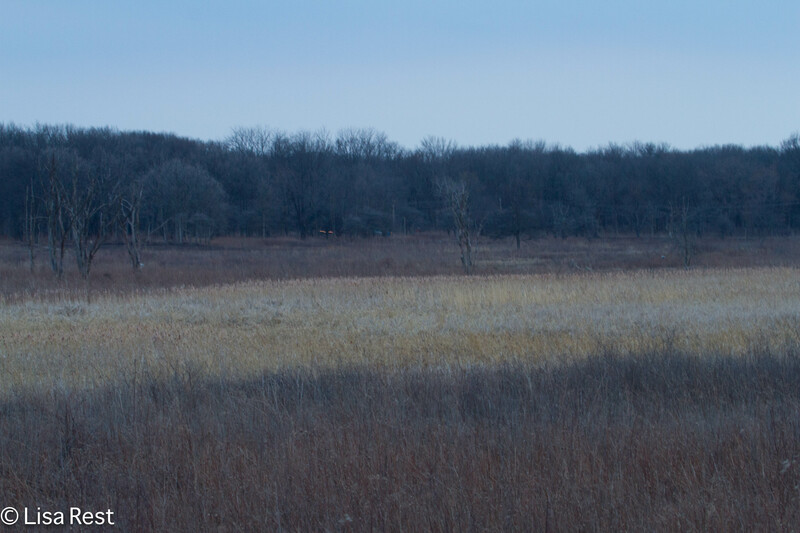 After running errands with the Prius, I met Lesa at Wolf Road Prairie around dusk to see if any American Woodcocks were displaying. 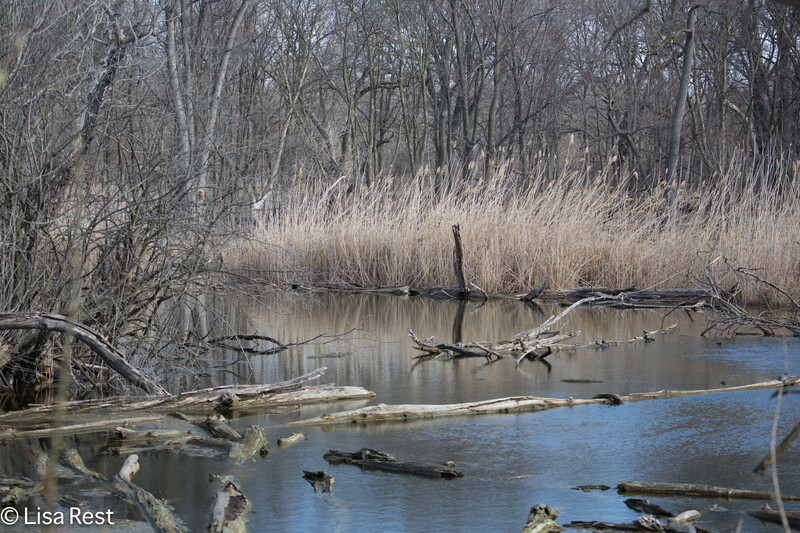 You can take a virtual tour of this site at the first link and learn all about Woodcocks from Cornell at the second. The Woodcocks started to “peent” some time after I took the above photo but did not fly until it was as dark as when I took the one below. Needless to say we barely saw anything. But I got to practice driving in the dark with the new car. It took me a while to find the lights: I was a little dismayed that the options on the column were not illuminated, since this car seems to tell you what it’s doing Every Second. But I’m sure I’ll get the clicks memorized and won’t need to look at them. Or maybe there’s some setting somewhere that makes them go on and off by themselves. Everything else seems to be Twilight Zone about it, like the smart key. Have to study the manual thoroughly this week. Yesterday morning I took the new car to the Portage which is where the remaining photos on this page were taken, including the car’s portrait. 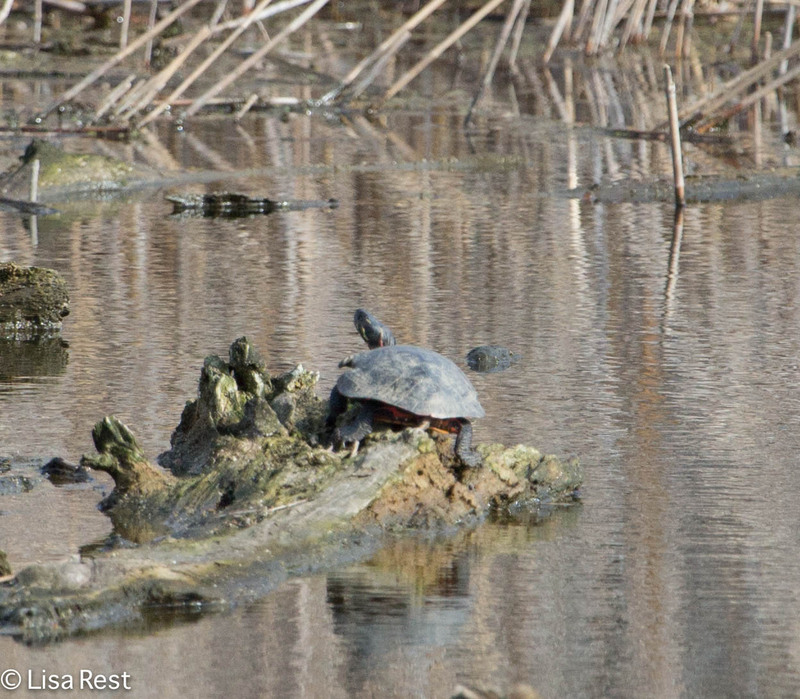 It was a good day for turtles. 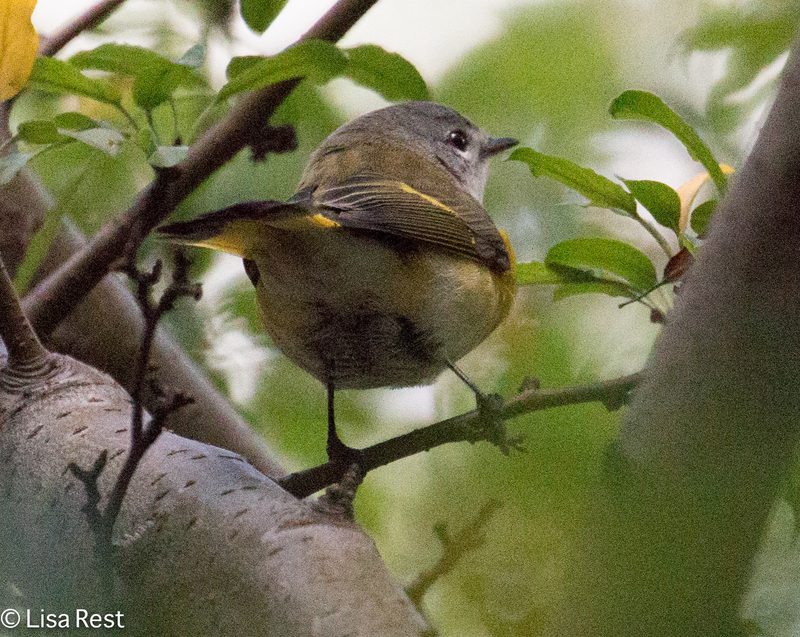 And I had 25 species of birds which is not remarkable, but among them were Yellow-Rumped Warbler, Brown Creeper and Ruby-Crowned Kinglet, first-of-year sightings for me, confirming passerine migration has definitely begun. 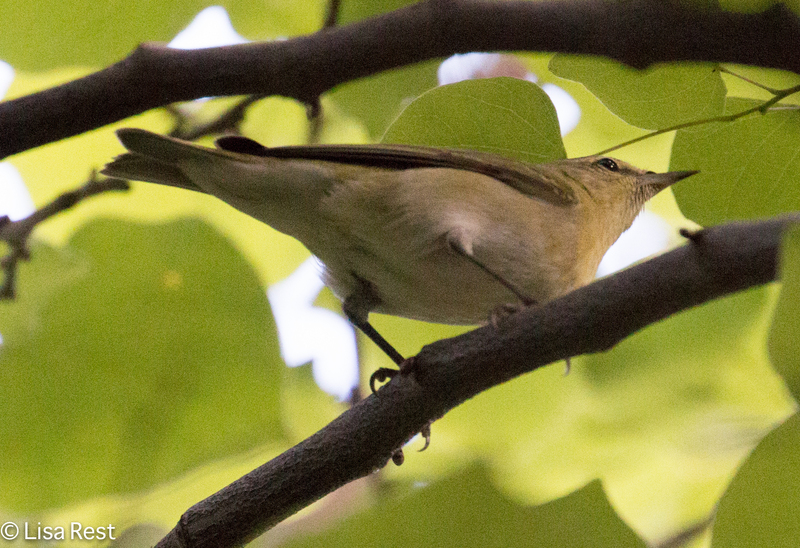 The warblers and kinglets were up too high in the treetops for photographs, but that’s where the bugs were on our first really balmy day. 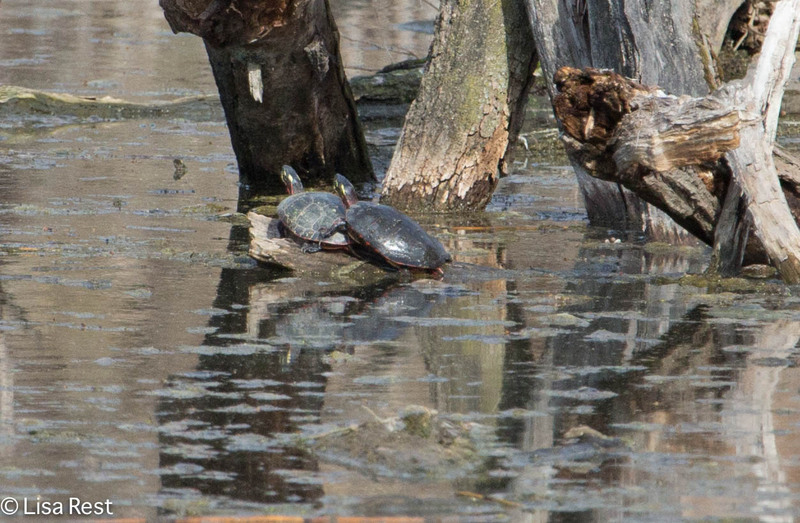 More Painted Turtles. I spent most of yesterday evening looking for title to the Taurus because I want to donate it as it was definitely not worth trading in. I didn’t even drive it to the dealer, I took a taxi. I was sure I knew where I was hiding the title, but after much ridiculous and hapless searching, I have given up looking for it and am going to get a duplicate issued. Getting organized is on my list of things to do this summer, not this week. 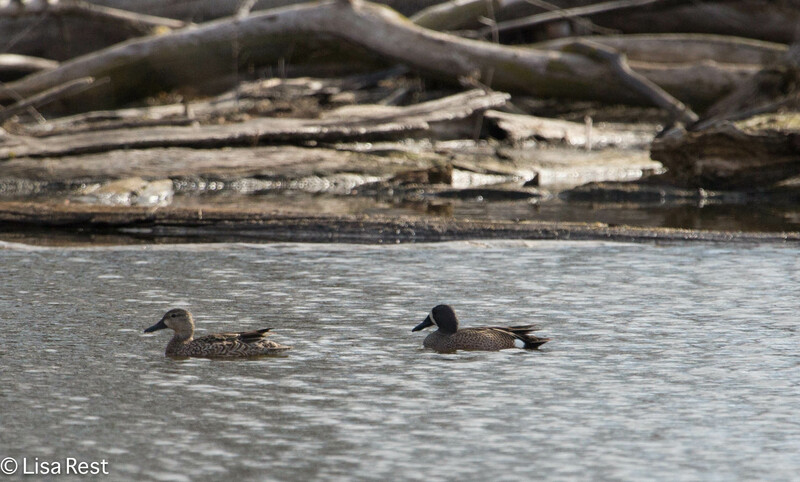 Two more Blue-Winged Teal flushed when I walked by, and while I’m sorry I disturbed them, you can see the blue on their wings. I was late getting in to work this morning. The birds made me do it. 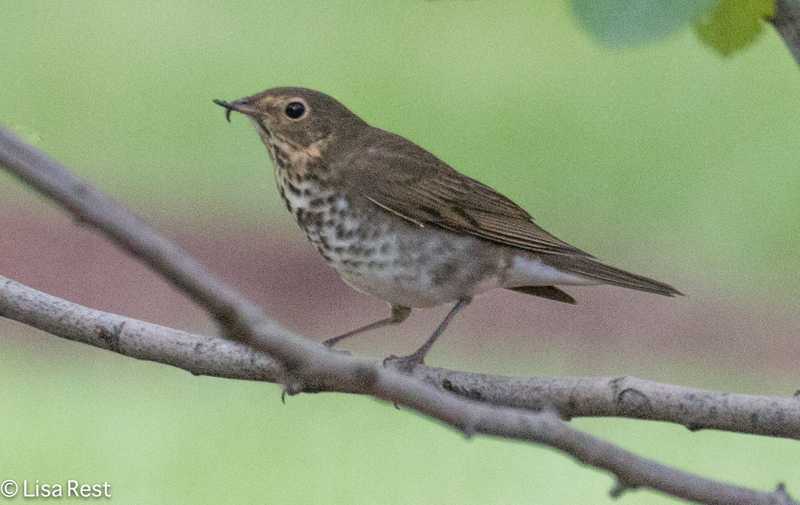 First, I found a dead Hermit Thrush at 123 N. Wacker, the same building where I found the stunned Hermit Thrush last week. It was windy and chilly this morning, so I should not have been surprised, I suppose, but I hate to see dead birds. 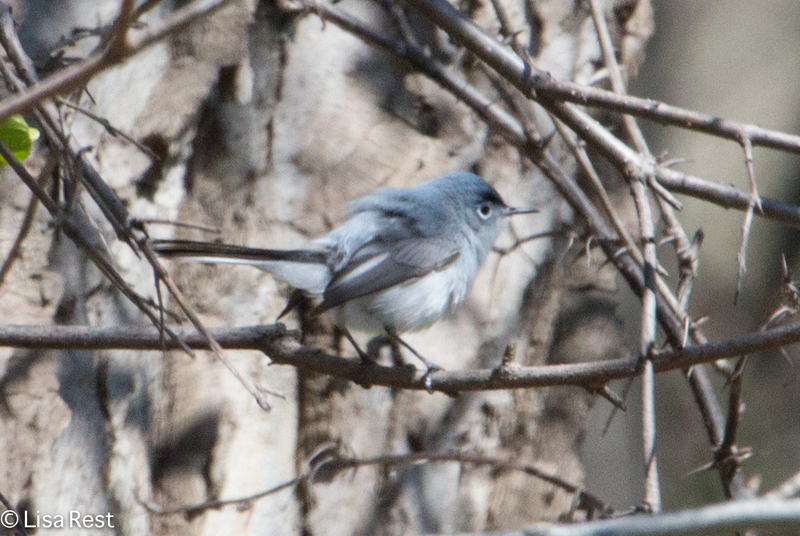 What a beautiful bird it was too; could not have been dead long. At any rate, what else to do but pull out one of my trusty paper bags and call Chicago Bird Collision Monitors? They were very busy and my ca;; went straight through to voice mail. 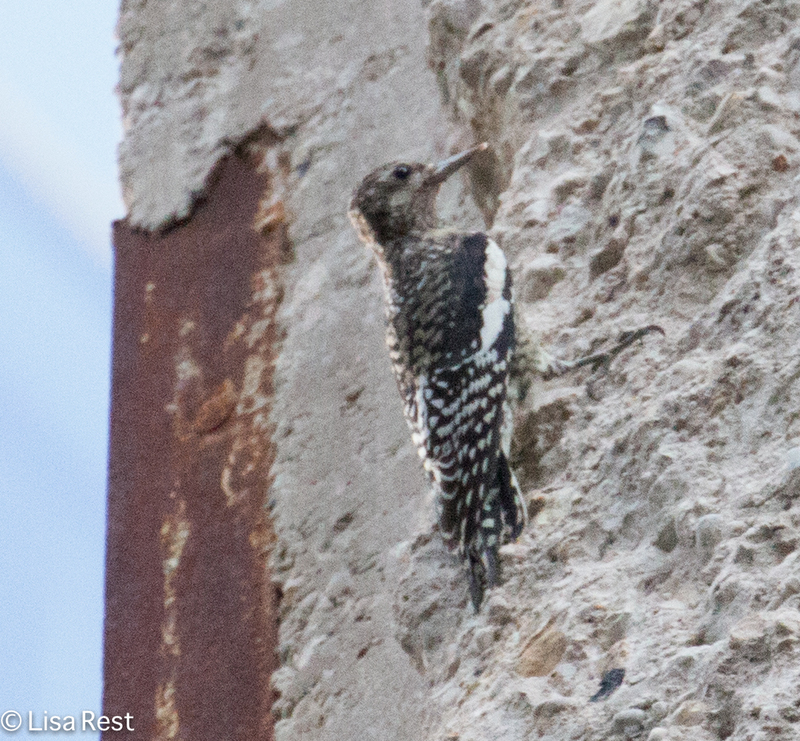 Then at 155 N. Wacker right near the entrance to the building, which has an enormous glass-walled facade underneath a portico, I found a stunned Brown Creeper. It’s amazing to me how many people walked by and did not even stop to look at this little gem. He was alive and at first having none of me catching him and putting him into a bag, so I stayed with him as he tried to catch a spider. 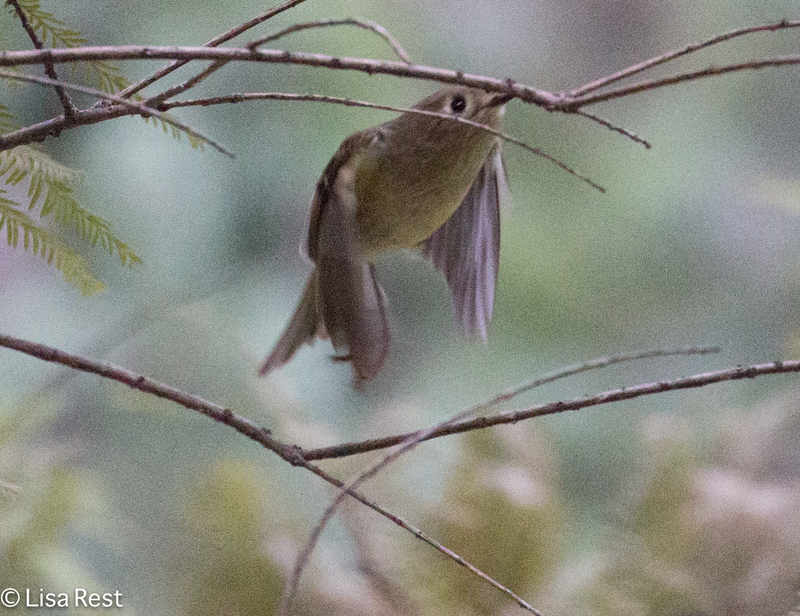 The spider escaped and I tried to edge it back toward the bird but the spider was having none of it. I started emptying my bag to use it as a net, but the creeper was wise to that and started flying up against the big glass wall until he became exhausted. 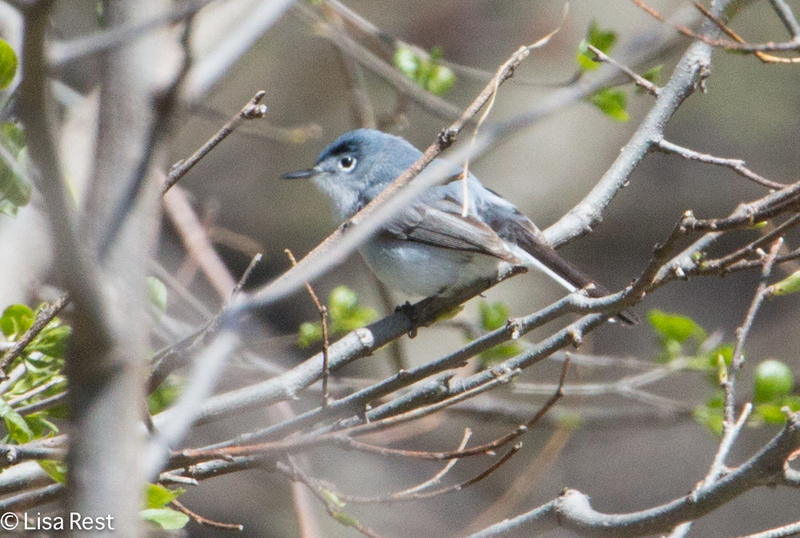 That was when I caught him more easily and, thinking I was going into work and the Bird Collision Monitors were too busy, I took him over to the albeit-not-so-great trees in the mini-park at 155 N. Wacker. 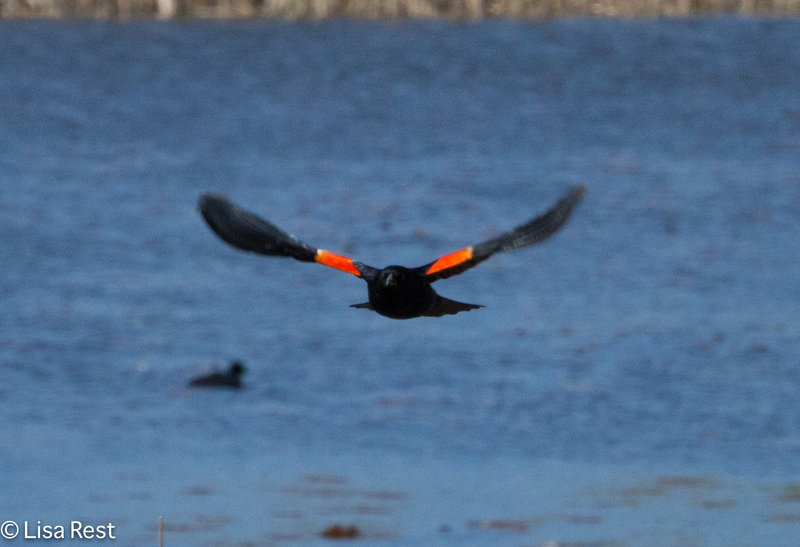 He seemed okay with that and he flew to the trunk of the first tree. 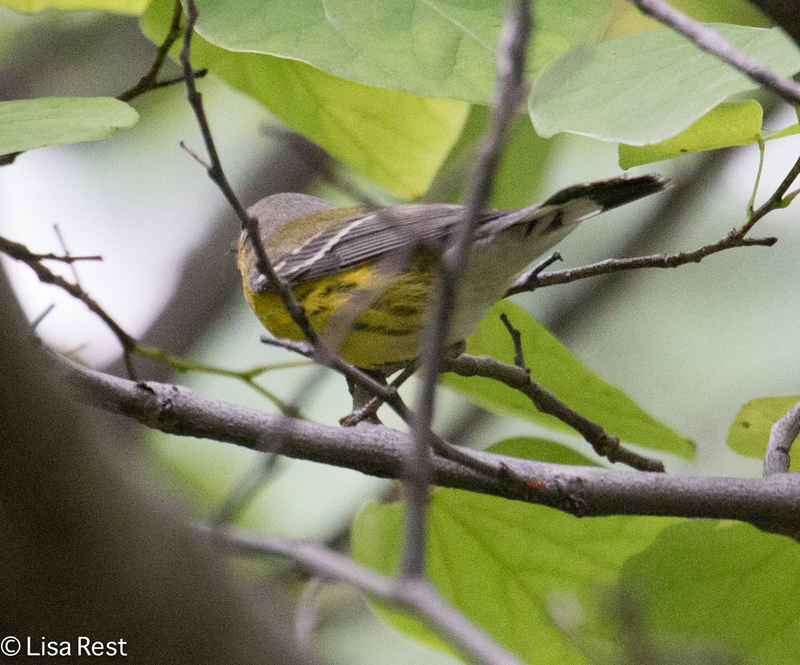 I was then in my usual spot checking out the White-Throated Sparrow population and decided to walk around the back to where there is a bike rack. 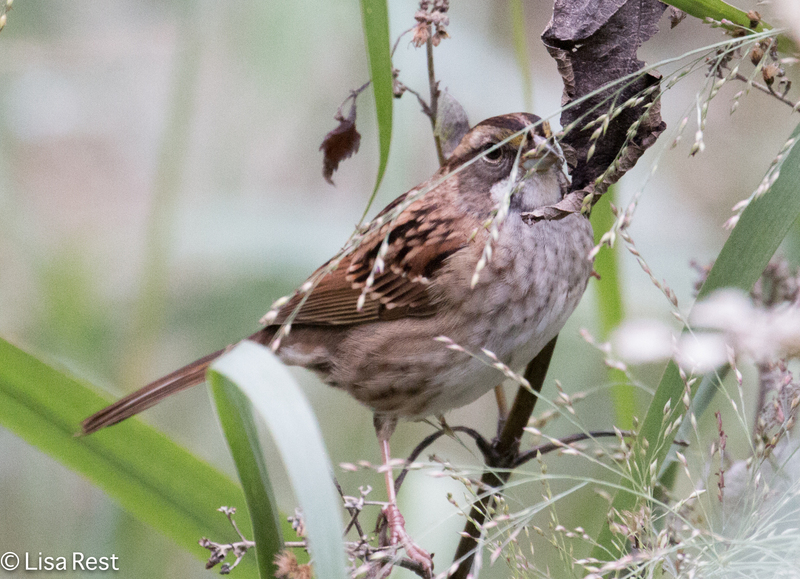 One White-Throated Sparrow was calling from a bush there. 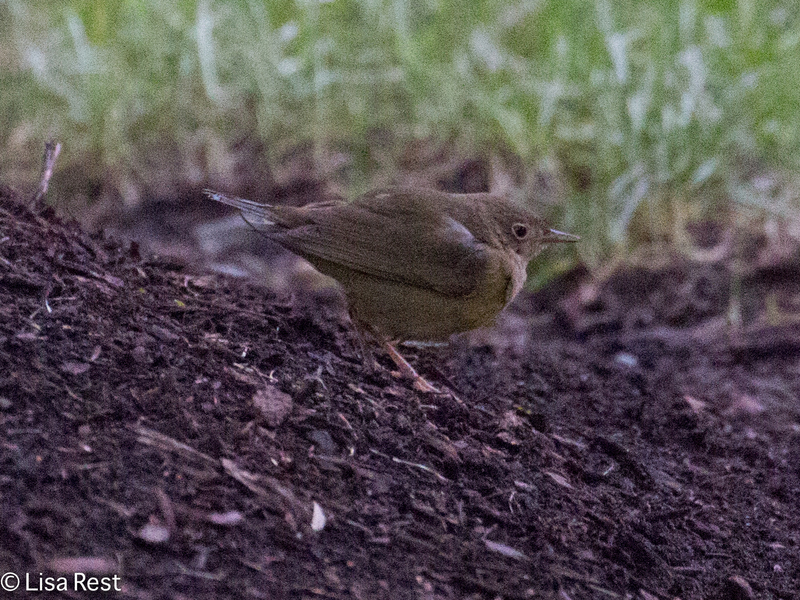 I was then ready to leave, figuring I had seen everybody, when I encountered a stunned Hermit Thrush on the sidewalk. 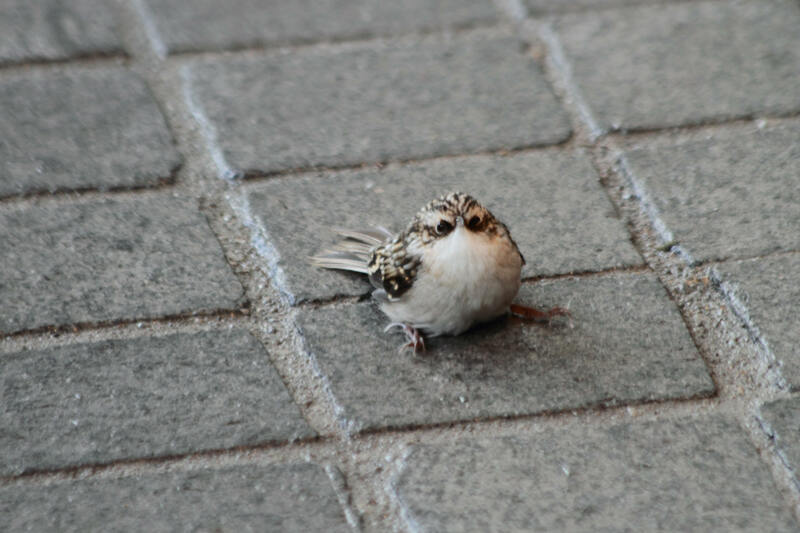 I could not imagine missing him, so he must have just hit the building while I was visiting the sparrow. The thrush was easy to pick up in that state, so I put him in a bag to keep him warm and out of trouble, affixed a paper clip to the top, and called the monitors again. I knew now I was going to stay and wait for help, however long it took. The monitor taking calls rang me back and said they would send someone right over. Soon Nancy called me and said she was on Wacker Drive in front of the building. 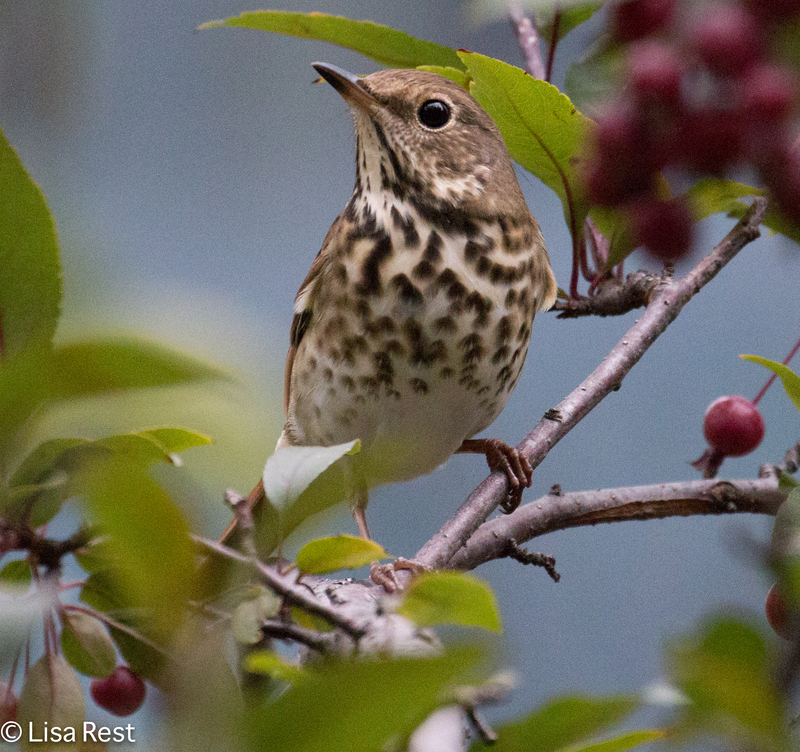 I walked over and delivered the two thrushes. One dead, one alive. I watched as she labeled them and made sure she had the correct information for each bird. We chatted a little and I left. 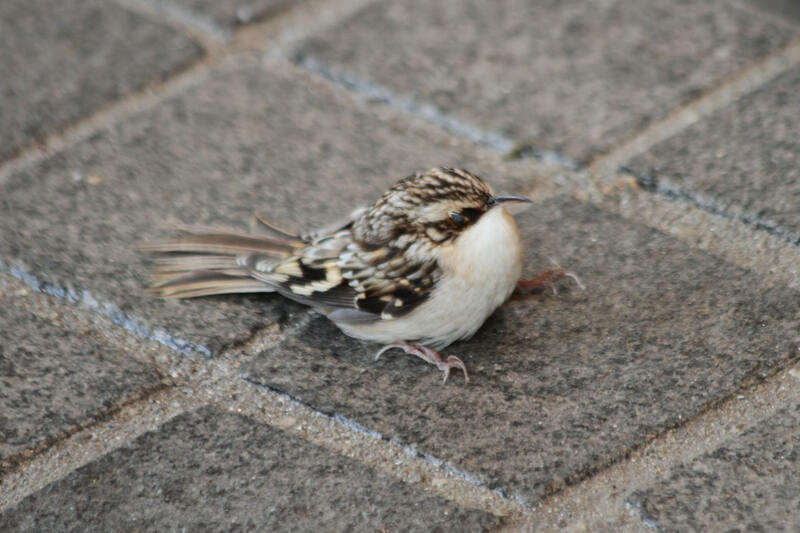 But then I found a Brown Creeper, most likely the same one, splayed on the sidewalk by the windows. 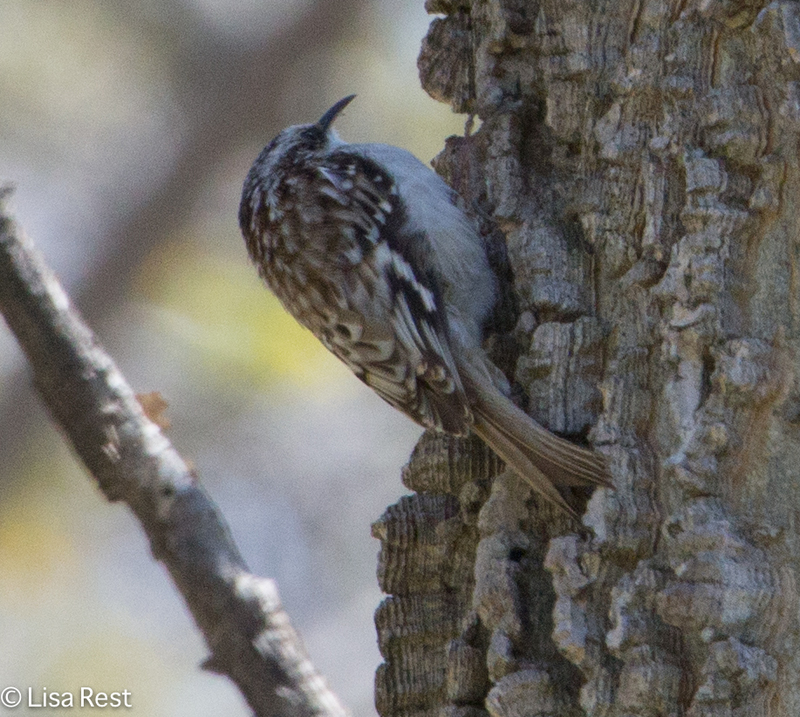 I reached down, picked him up, and headed back to Wacker Drive, running north, yelling, “Nancy, Nancy!” When Nancy turned around, I met her with the Brown Creeper. She opened up a little bag to receive him and I reached in with my hand to release him – and he would not let go. He clung on to my warm finger with his tiny foot. I told him he had to leave, that Nancy would take good care of him, and he finally let go with a little prodding from me. I wonder if by then he might have decided his fate was inextricably connected to mine. I trust Nancy got him to a better place where he found his bearings and continued on his journey south. 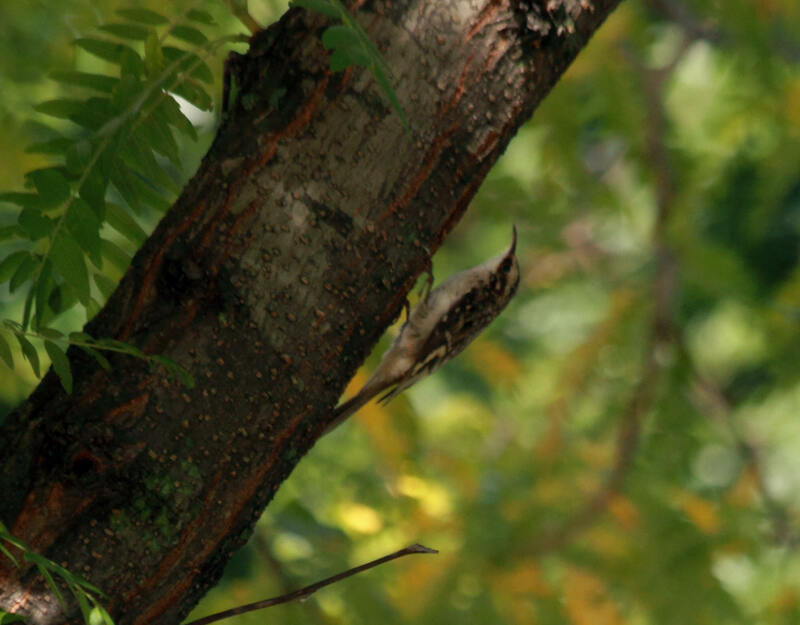 Here’s a picture of a Brown Creeper I took last week or so, who was not lost. 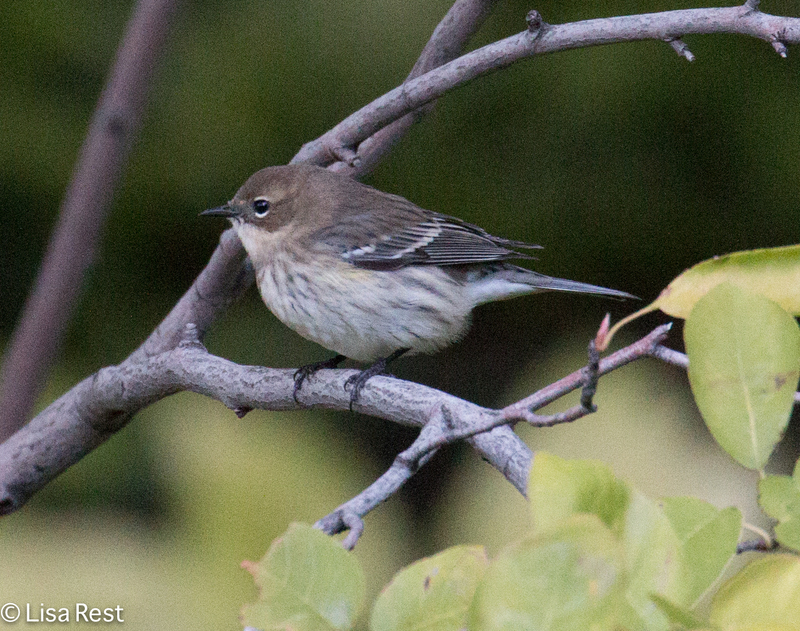 And another this afternoon, at Lake Shore East Park. 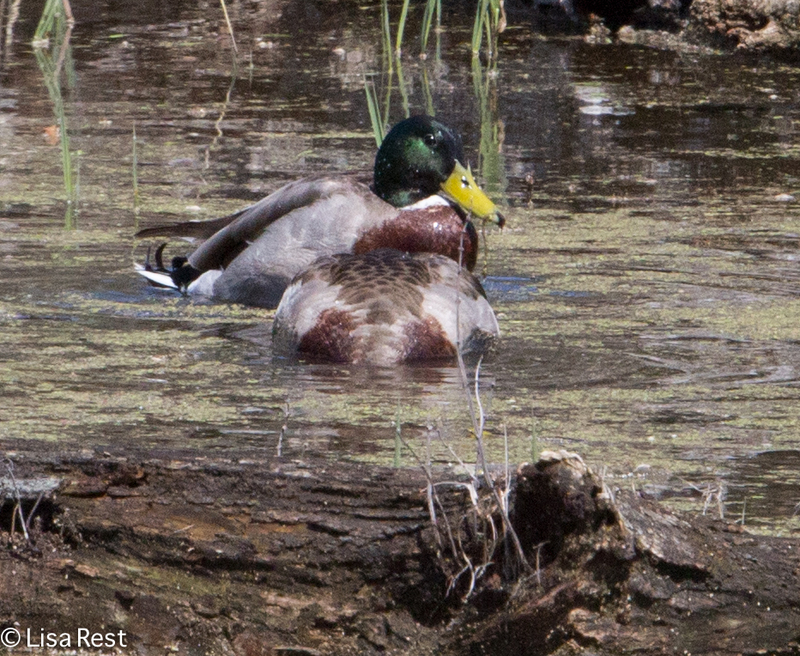 Please pardon this brief interruption.While I’ve been trying to get through other pictures for another post, I’ve been birding as usual on my infrequent lunch hours, interrupted by rain… (lots of it – maybe I should not have danced so hard through the drought?). Yesterday on the way back from Millennium Park where I had basically seen nothing “new” and it started to rain again…I was carrying my 40D, an umbrella and the peanut bag, I had forgotten I had the camera on another setting for the rain pictures on the way in… and who should show up but my first-of-year Black-and-White Warbler, looking very bedraggled and wet, behaving like a Brown Creeper scaling the tree trunks, but definitely not a Brown Creeper. 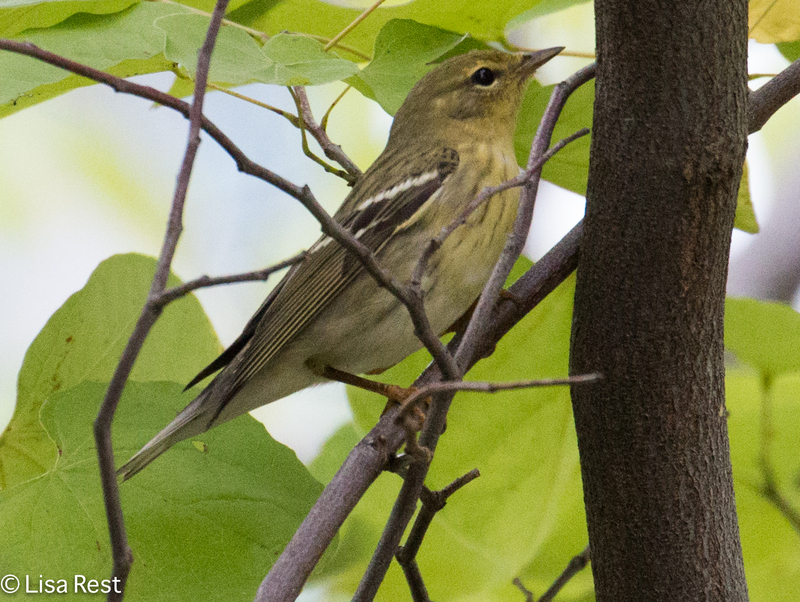 In spite of the umbrella and the wrong setting a got a picture or two of the warbler anyway. And here are a couple other volunteers from the park.